We are fully licensed and our only business is security. There are now some cable TV companies who are trying their hand and alarm systems. Do you really want the cable company and its installers as your trusted security company? Now we have wireless phone companies also attempting to install security systems. These are the same phone companies that literally gave away your info and data without a warrant or even your permission. Do you want to give absolute trust to these companies with your codes, passwords and data? 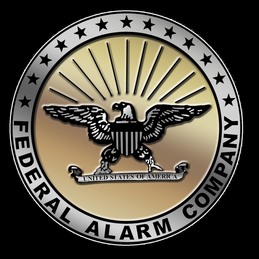 FEDERAL ALARM is a 40 year old company. We are sure you have also been getting a horrendous amount of alarm telemarketers with fabulous claims. Many of those companies are based in Utah or Washington state. They hire subcontractors to do the work. Many of these companies are not even licensed in your state. For instance in New Jersey alone, there are minimum of FIVE licenses required. Ask the telemarketer for the license numbers then check them with the NJ Attorney General and the New Jersey Dept. Community Affairs. Some will even lie and say they do not need a license or permit before starting. Check them out with your township or city. The systems that these telemarketers are pushing are of the “all in one type” which can be defeated in 3 seconds – way before and calls can be transmitted to the central station – no matter they claim. To find out about the company’s record do a Google search. Type in complaints ADT, or complaints VIVINT, etc. Our central monitoring stations are 24/7, have back up systems and U.L. approved. For your benefit our monitoring contracts are for just one year. You probably have a cell phone contract that is for 2 years and you know what a hassle that can be. Most other alarm companies have a three year contract. A few even have a 5 year contract – and they will take legal action if you attempt to break that long contract. We have been protecting life and property for almost forty years. Our monitoring rates are lower than the companies you see advertised on TV. Free site survey for your new security system by a licensed private detective. Our systems are designed and installed for your utmost protection. Those all-in-one systems are designed just for a quick 45 minute installation. Our systems’ “brains” are housed in a locked metal box. If our keypad is smashed the system will still alert the police. Our systems are not “table top” units (sold on line) that simply rest on top of a table and plug in. Discounts to churches, synagogues, spouses of active duty military and seniors on a fixed income. Enjoy up to a 20% insurance discount.